This versatile card sort may be used in a variety of ways. 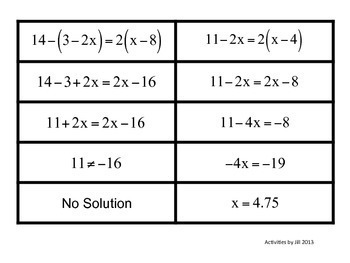 Twenty multistep equations are included in this activity. Cards in two sizes are included - you choose which set to use. This can be a single day or a multiple day activity depending on how it is used. 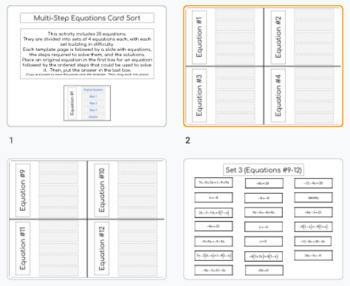 I suggest choosing 5-8 equations, mixing all cards (steps) together and having students sort the equations either individually or in small groups. The twenty equations allow you the flexibility to select questions with or without fractions. Also, the equations with no solution or infinite solutions may be included or not, depending upon the needs of your students. 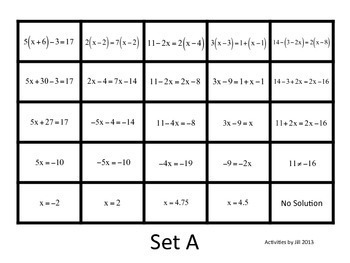 Give each student the cards for one or two equations. Have them sort the steps to access prior knowledge, use as bell work or as an exit ticket. If you use regular paper for this, the slips may be glued into students’ interactive notebooks. Select problems to use for station work or math centers. Station work may be differentiated by separating equations according to whether they involve integers only, fractions, or involve no solution/identity. 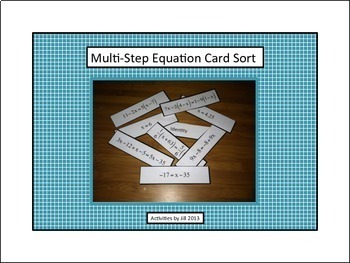 Multi Step Equation Card Sort by Activities by Jill is licensed under a Creative Commons Attribution-NonCommercial-NoDerivatives 4.0 International License.